Hawaii is one of the most culturally diverse states in the U.S., and has been for a long time. Besides the tourists who visit from all over the world, the immigrants who are currently moving to Hawaii come from a wide variety of countries, including the Philippines, China, Japan, South Korea, Vietnam, Thailand, Canada, Brazil, Mexico, Tonga, Samoa, Guam, and Micronesia. And then there are kama’aina, the long-time residents whose ancestors came to Hawaii generations ago, and are an amalgam of native Hawaiian, Chinese, Portuguese, Puerto Rican, Japanese, Okinawan, Korean, Filipino, and mainland American cultures. Mixed-race people and couples, who might be considered oddities in other parts of the U.S. or world, are unremarkable here in Hawaii, where there’s been a long history of miscegenation. Evidence of Hawaii’s cultural influences can be found in the foods we eat here, the holidays we celebrate, the festivals that are always happening, the arts that are performed, the traditions that are upheld, and the languages that are spoken. Not only is it often fun to experience these different cultural elements, but it’s also an education in human understanding. Even with the residential and commercial development that’s happening throughout the state, it’s hard to deny that Hawaii still has some of the most stunningly beautiful landscapes and seascapes in the world. Being surrounded by so much natural beauty — the lush, green mountains; the multi-hued ocean; the glorious sunrises and sunsets; the brilliant tropical flowers blooming everywhere — has definitely had a positive psychological effect on me. If I ever feel stressed out or a little blue, all I have to do is take a walk outside, go for a swim in the ocean, or even take a scenic drive — I instantly feel more at peace with the world and have a greater sense of well-being. I get the sense that Hawaii residents tend to “work to live” rather than “live to work” — at least more so than their mainland counterparts. My theory is that Hawaii’s mild climate, beckoning beaches, and earlier work schedule are all conducive to having a life outside of work. When your workday ends at 4pm, the sun doesn’t set until 6 or 7pm, the temperature is still around 80 degrees, and you’re within easy driving distance of the nearest beach, you’re less likely to drive straight home and turn on the evening news to hear about all the bad stuff happening in the world. Instead, you might swing by the beach to catch a few waves. Or pick up the kids and take them to the park. Or go to canoe-paddling team practice. Or meet friends at a local restaurant for pupus and drinks. Or simply enjoy watching the sun set from your lanai at home. And if you have relatives or business in the Asia-Pacific region that requires you to travel there frequently, living in Hawaii will make those trips a little easier and more convenient to take. Nonstop international flights from Honolulu Airport are being added all the time — for example, China Eastern Airlines recently announced that it will begin nonstop service from Honolulu to Shanghai, China on August 9, 2011. Hawaii’s tourism-based economy, island geography, and volcanic activity make for some unique job and educational opportunities that can’t be found just anywhere. Those interested in marine biology or oceanography can find job and study opportunities through the University of Hawaii’s extensive programs in those fields. Kilauea on the Big Island is one of a handful of places in the world where volcanologists can study an active volcano closely. 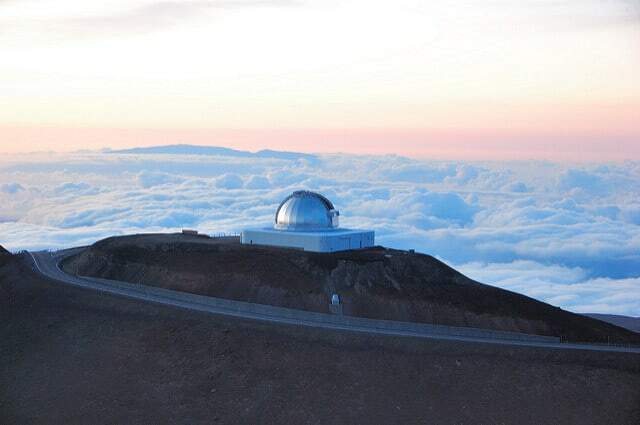 Also on the Big Island is Mauna Kea, home to the world’s largest observatory for studying optical, infrared, and submillimeter astronomy. And if you work in the hospitality or tourism industry, you’d be hard-pressed to find a place with as high a concentration of job opportunities as Hawaii. Hi, Mac: If you think you’d like to live in Hawaii in the future, going to university there would probably be a good way to find out now if you really like living there. If you’re a foreign national (not a U.S. citizen), you can get a student visa. Lots of international students attend the University of Hawaii. Hi my name is Tiffany and i am 27 years old. I have a 9 year old boy and a 5 year old girl. I woke up one day recently and realized that I’m not happy with our life here in Ohio. I mean its okay but i feel like I work all the time. The weather is always so gloomy an nasty, I was asked the other day if I died Tomorrow would i be happy with how my life has been. Well i got to thinking about it. No I’m not. I think Hawaii could make myself and my family happy and give us more time together than me working all the time and the sun setting. Just not really living our full potential of this one life we were given. So i guess my question for you is. Is there jobs out there and is it a good place to raise some kids? What part would be a good part for us to move to? I’m in construction or bartending or cleaning. Really work is no longer the most important thing to me anymore. My memories I want to make with my kids. Any advice would be great. Thankyou! The weather here is definitely better than Ohio. But I’m not sure you’d be working any less in Hawaii. There definitely are jobs here in construction, bartending, and cleaning. I’d say jobs are pretty easy to come by in Honolulu (on Oahu). The problem is, the ones that are easy to get tend to have low salaries. One good thing, though: Hawaii state law mandates that if you work at least 20 hours a week, your employer must provide some sort of health insurance. To get a better idea of salaries and the cost of rent in Hawaii (which will be your main expense), take a look at the job ads and rental ads posted on Craigslist Hawaii. Hawaii is a great place to raise kids, I think. The only downside is the public school system here, but some schools are better than others. The schools in Mililani (a town in central Oahu) are supposed to be good. Momilani Elementary School in Pearl City (also on Oahu) is the #1 public school in the state. Aina Haina Elementary in east Honolulu is also supposed to be very good. So I would suggest moving to a neighborhood that has a good public school that your kids can attend. Here’s an article with more info on public schools in Hawaii. I want to go to Hawaii so bad! However is there any places who will give me a place to stay if I work with them part or full time? I have herd that there are places that do this. Yes, there are some work-stay arrangements that can be found here. Some farms, hippie communes, and private citizens will let you board for free in exchange for your labor on the property. The type of labor varies, depending on the employer. It could be farm labor, property maintenance, landscaping, housekeeping, child care, caregiving (for an elderly or disabled person), computer work, etc. To find these kind of arrangements, go on Craigslist and search for keywords such as “board”, “free rent”, “work exchange”, “rent exchange”, “room exchange”, “free room”, “caretaker”, etc. in the Housing and Jobs sections. Also visit WWOOF Hawaii to find out about becoming a WWOOFer (organic farm work in exchange for a place to stay). would love some help……thanks !! !